Our successful model for years, hundredfold proven in practice. The self-cleaning slotted plates made of high-quality aluminium make a universal application for all cereals possible. The fully mobile MUF makes a fast site change simple. The MUF is the ideal circulating batch dryer for the quality and price-conscious farmer or contractor and impresses by its outstanding performance! Your mobile circulating batch dryer MUF is filled via the big feeding hopper and the elevator. The air heated up in the air heater is pressed into the inner hot air duct by means of the radial fan and then flows through the drying container filled with the product. The air absorbs moisture. The product is collected in intervals by the discharge mechanism and conveyed into the upper part of the drying container by the elevator. This upper, unventilated area serves as resting and temper zone. Here the moisture of the grain inside conforms to the moisture of the grain surface, before the grain gets again into the active drying zone. 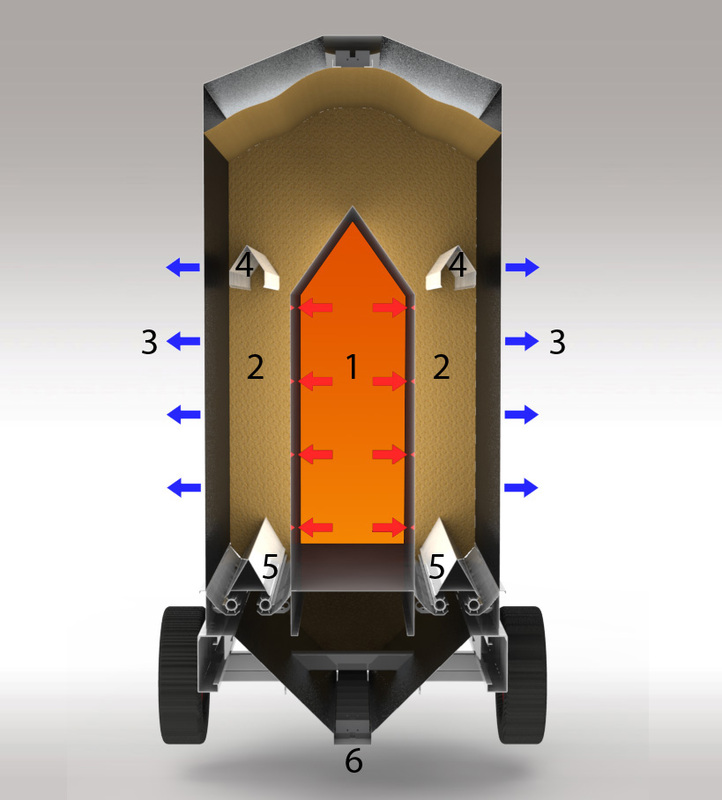 From size 110, an additional unventilated resting zone is included in the plant, making further termpering and thus energy saving possible ("dryeration"). The multi-term automatic system operates with a high hot air temperature at the beginning of drying and then switches gradually to a lower temperature level for final drying. This procedure brings about a high energy efficiency and, at the same time, treats your product carefully. Having reached the requested final moisture (easy sampling and monitoring of the grain temperature), the dryer automatically switches to cooling. The product cools down to storage temperature and is discharged via the circular elevator. The following diagram shows an example of the multi-therm temperature cycle for maize drying from 35 % to 14 % moisture content. By an infinitely variable selection of the drying temperature, all agricultural cereals can be dried. The plant can be cleaned easily. 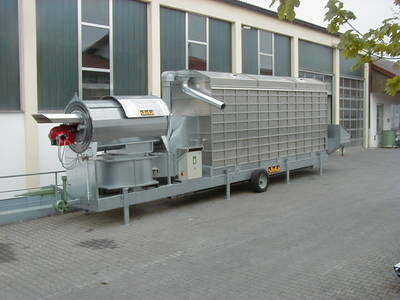 The residual emptying flaps make processing also high-quality seeds possible. The dryer is made of first-class material. The walls of the drying container are made of half-hard, high-quality alloyed aluminium plates with slotted holes. These are corrosion-resistant against weather influences and the humid exhaust air, self-cleaning and also very well suitable for drying rapeseed.